The Benefit Sanction Debt Trap: Is this Iain Duncan Smith’s Nastiest Move So Far? Unemployed and disabled people could find themselves owing the Government hundreds, or even thousands of pounds, if they fail to attend workfare or miss a meeting with the Jobcentre. Details are emerging (thanks to @refuted) of a horrifying regime planned when Universal Credit is introduced which will see emergency Hardship Payments converted into repayable loans. These payments will be all that is available to people who have had benefits sanctioned for not meet the draconian and ever-changing conditions for claiming benefits. Claimants can face benefit sanctions for being late to an appointment, missing a meeting or failing to turn up for unpaid workfare placements. 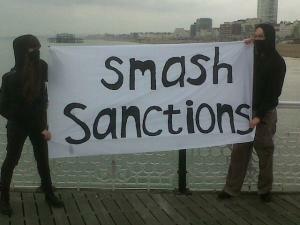 In some cases sanctions can last up to three years. Hundreds of thousands of benefit sanctions each year are now inflicted on some of the poorest people in the country by Jobcentres.